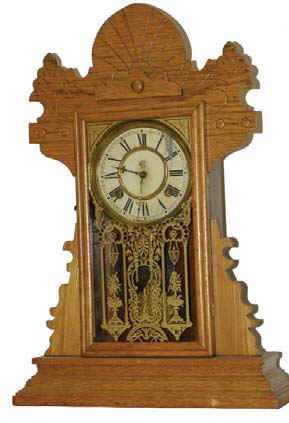 Waterbury Clock Co. mantle clock, "Fishkill", ca 1895. Oak case has been cleaned-polished, like original. There are no breaks or repairs but there is a split on the right top. It could be from drying of the wood or someone just banged it against something and it split 3 inches. Not a big deal, but there nonetheless. Two labels on the back, slightly dark. Glass, pendulum, and dial, all original. There is a scratch mark to right on the dial. How did they do that? Fishkill not pictured in my catalogs.